MONTEBELLO — The Montebello-Ashiya Sister City Association (MASCA) announced its two 2018 student ambassadors and two host ambassadors at the installation reception on May 3 at the Beverly Hospital that was emceed by Emma Delgado, president of MASCA. Selected as the new student ambassadors are Lauren Gamboa, 16, daughter of Luis and Valeska Gamboa, and Noah Lopez, 18, son of Sonia Holguin and Donald Lopez. Lauren is completing her sophomore year at Notre Dame Academy in West Los Angeles, where she has been on the Student Council since her freshman year and enjoys piano playing, painting, traveling, and hanging out with friends. Noah was not able to attend the installation program due to his busy freshman year class schedule at the University of San Francisco, where he is an architecture major. His mother expressed her appreciation to MASCA on the selection of Noah, who is proud of his long-time commitment to the community and Don Bosco Technical Institute, where he graduated in 2017. He was also the MASCA host ambassador last year. Noah’s hobbies are sketching, working out, helping coach cheer, and playing video games. The young representatives will depart on July 23 and arrive in Ashiya, Hyogo Prefecture the next day to begin their three-week Japanese cultural immersion, which includes living with host families. Announced as the 2018 host ambassadors are Zachary Bernal, 17, who is completing his junior year at Montebello High School, and Angel Ruiz, 17, who is graduating from Schurr High School. 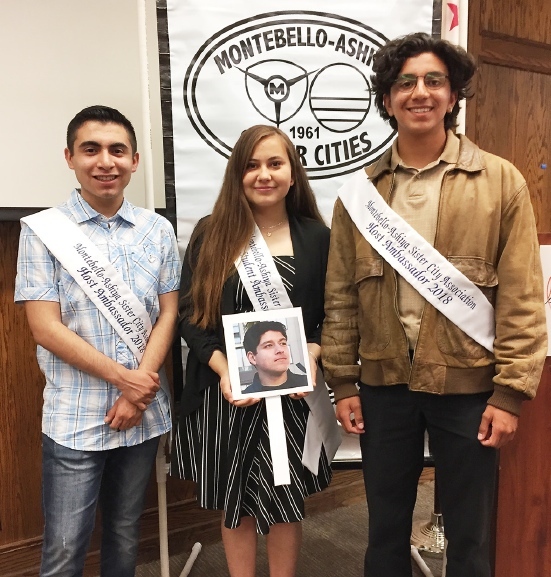 Zachary and Angel will serve as hosts to Ashiya Cosmopolitan Association’s 2018 student ambassadors, Motoka Masaki, 16, and Shinnosuke Yagi, 15,when they arrive on July 30 and live with host families in Montebello for three weeks. In 1961, Montebello and Ashiya signed an international agreement as part of the People to People Student Ambassador Program initiated by President Dwight D. Eisenhower in 1956. Their respective sister-city organizations created the Student Ambassador Program in 1964 and have been exchanging two high school or college students every summer.